In nature, spiders do a lot of good. They eat pesky insects, like mosquitoes and flies. However, some species of spiders can do more harm than good – particularly black widow and brown recluse spiders. Looking to keep spiders out of your home or business? Call the experts at Horizon Pest Control at 1-888-824-7860 for a free quote. In total, five species of black widow spiders are native to the U.S. These spiders are known for the red hourglass shape located on their back. 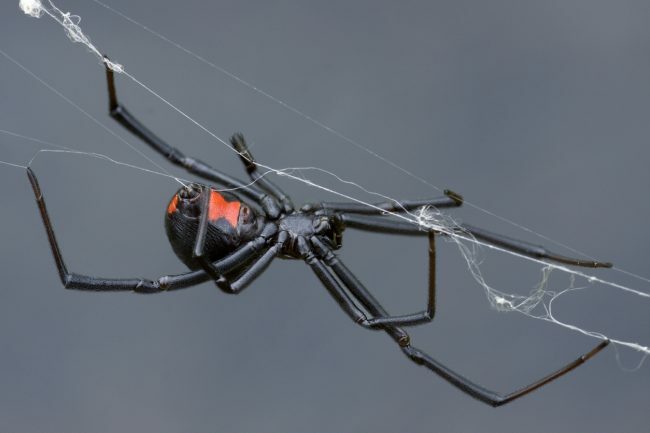 Black widow spiders are attracted to dark, secluded locations, like basements, garages, closets and woodpiles, and notorious for weaving messy, irregular webs near the ground. While the male black widow rarely bites, the female may bite when disturbed, especially after laying eggs. When black widows bite, they inject a poison that affects the nervous system. Some people report severe pain, burning, swelling and redness directly following the bite. Other symptoms can include sore muscles, nausea, vomiting, difficulty breathing, abdominal pain, excessive sweating and weakness. Although bites can be deadly, fatalities are highly unlikely when medical care is promptly sought. Brown recluse spiders inhabit the Central Midwest, from Nebraska to Texas and Ohio to Georgia. And while brown recluse spiders aren’t native to New Jersey or New York, they can be transported during a move or shipment from these areas. Though rare, brown recluse spiders may establish populations in a single building. As their name suggests, they prefer to remain out of sight in recessed and hidden areas. Like black widows, brown recluse spiders have a poisonous bite. They’re not aggressive by nature – when bothered, they’d much rather run for cover – but if they feel trapped, they might bite and inject venom. Brown recluse bites produce a stinging sensation at first. In the hours that follow, an intense pain and blister will typically develop. The surrounding area may become swollen. Besides physical discomfort, brown recluse spider bites can also lead to fever, chills, joint pain, seizures and coma. Get rid of pesky and potentially dangerous spiders in your New Jersey home or New York City business. Contact Horizon Pest Control for professional spider extermination services.